In one of the hottest British days on record, crowds gathered to watch Senteable’s Co-Founding Patron The Duke of Sussex take home the Sentebale ISPS Handa Polo Cup today, alongside his teammates, including the charity’s Ambassador, Nacho Figueras. The trophy was presented by The Duchess of Sussex at the annual fundraising event, which supports the charity’s work with young people affected by HIV/AIDS in southern Africa. It has been a busy week for Sentebale; on Monday The Duke joined the charity’s Youth Advocates from Lesotho and Botswana at the International AIDS Conference in Amsterdam, to advance the Let Youth Lead advocacy programme. Today, the Sentebale ISPS Handa Polo Cup, hosted by the Royal County of Berkshire Polo Club, brought a crowd of over 300 guests together to enjoy a day of polo and philanthropy in the scorching summer sun. 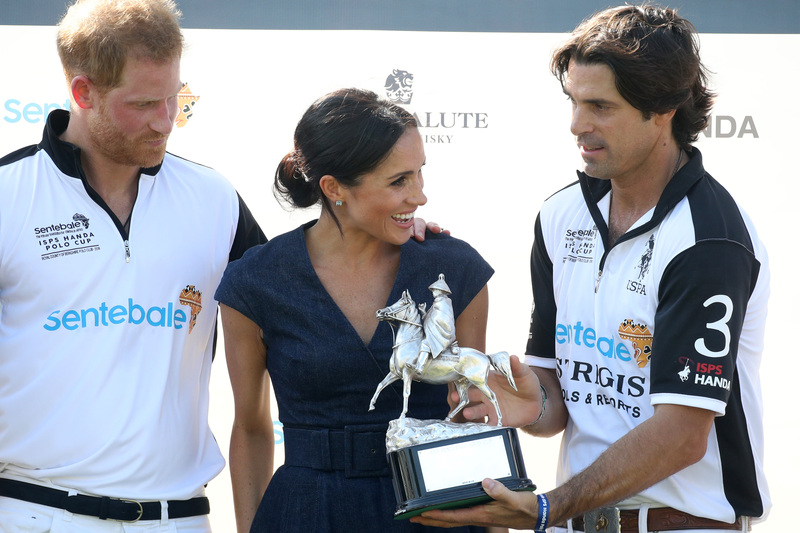 It was a close match, culminating in a winning pass from The Duke of Sussex to Sentebale Ambassador Nacho Figueras, who scored the final goal. The score was 5 – 4, with the Royal Salute team, captained by Malcom Borwick, narrowly missing out on the coveted prize. Sentebale’s flagship fundraising event has been running since 2010, and has taken place in different locations around the world, from Singapore to South Africa. This is the first time since that the prestigious event has returned to the UK. This is also the first year that ISPS Handa has assumed the role of title sponsor, having supported the event for a number of years. To date, the event has raised over £5 million for Sentebale’s work providing care, education and psychosocial support for children and young people living with HIV in Lesotho and Botswana, where the burden of the HIV epidemic remains. on Monday, where global key influential leaders in the HIV response made concrete commitments to better support the health of this generation. For more information about Sentebale, please sign up to receive the charity’s news at http://www.sentebale.org or follow the journey and be a part of the Sentebale ISPS Handa Polo Cup using the hashtag #SentebaleISPSPolo. Image credit: Chris Jackson Getty: Nacho Figuares; Prince Harry Duke of Sussex; Meghan Duchess of Sussex.